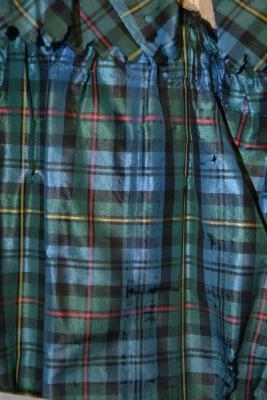 Blue and green plaid taffeta dress. Two pinked ruffles on skirt; one narrower ruffle on bodice. Wine Glass CLEAR STEMMED GLASS, CONICAL-SHAPED BOWL, CIRCULAR FOOT, LOPSIDED (OUT OF ROUND). 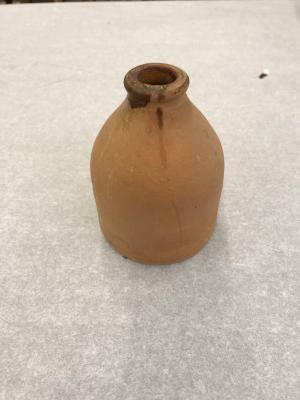 Small red clay jug with tapered neck and mouth. The bottom is inscribed, "Henry Gould (potter) of Newport RI." 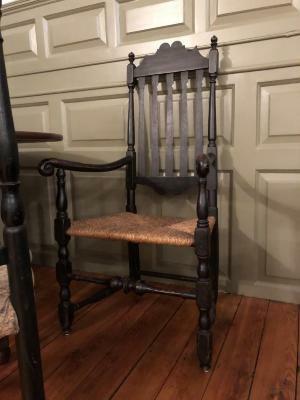 Country-style side chair, painted black. Possibly Little Compton construction. 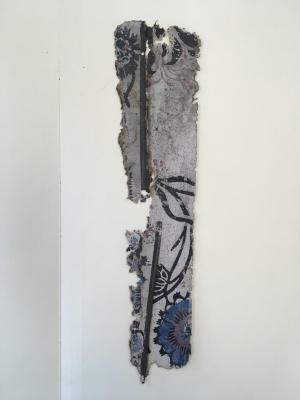 Collection of wallpaper fragments with various patterns from the Wanton-Lyman-Hazard House. Cobbler's palm made of brown leather. Completed at palm and thumb hole with string. 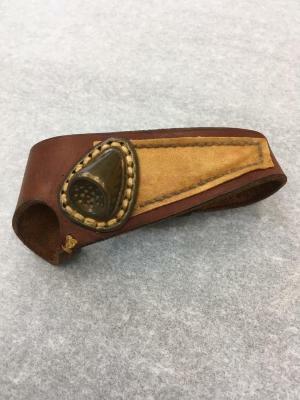 Small triangle of lighter brown leather with inverted thimble next to thumb hole. 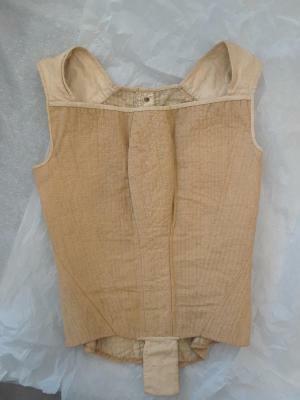 Tan stays with coarse linen lining. Bound in white leather with glazed linen on tabs. Twill trim on outside of corset 1/8 in. wide over top of some channels. Dark brown leather in PL eyelets. 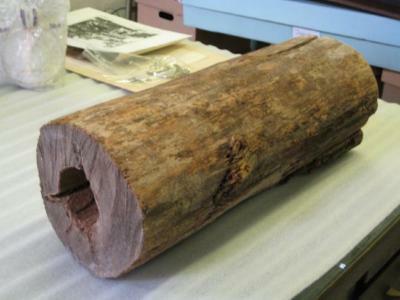 Large handmade spike from Brenton House. Made by Richard Donohoe. Tag included with description and maker's information. Wallpaper fragment from Rhoades-Pease-King-House. The fragile fragment features a pattern of yellow dotted leaves with white vines and burgundy tulips on a green/gray background. Whalebone stays covered with green woolen material , bound with white kid. 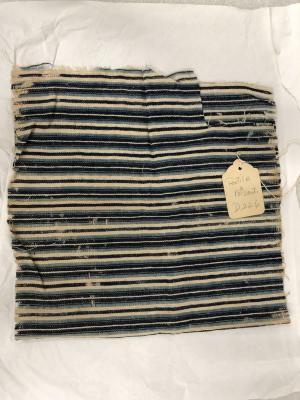 Lined with homespun linen, some with blue, white and natural stripes. 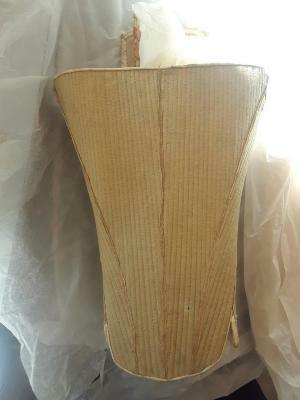 Unbleached hoop petticoat. Linen and split reed or over 3 groups hoops, placket holes padded with wool ovver hips. Tapes which will tie petticoat in oval form. 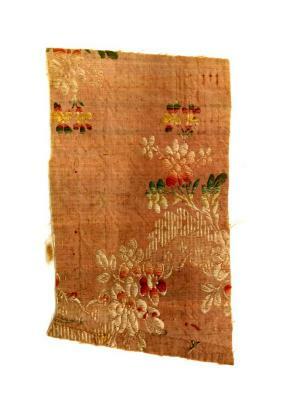 Swatch of brocade with rose ground. 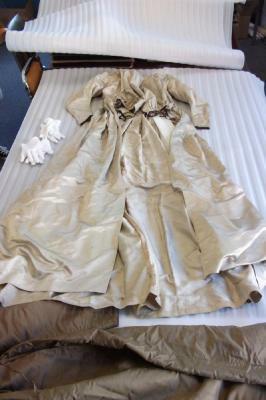 White bolt of India muslin with small silver stars, now yellowed. Light and dark indigo blue and white striped woolen fabric with some twilled stripes. 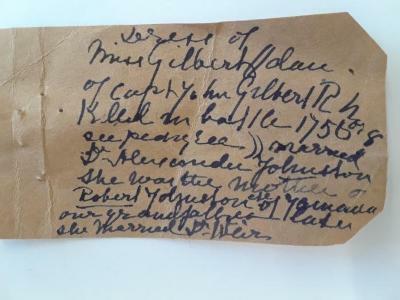 Ticketed in same hand as D225, "A piece of my great Grandmother's Petticoat more than a hundred years old. 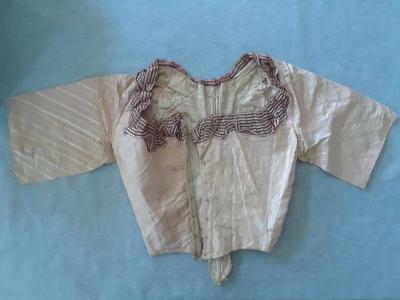 ~1885"
Dress waistcoat in cream brocaded with silver and colored flowers. Lining and back of cream twilled wool homespun. Men's white stickings made of fine silk. Full fashioned, embroidered white clocks. Similiar but not identical to D42. Men's white sine silk stockings. Machine made, with white silk clock. Similiar but not identical to D43. Colored flowers on cream ground. Brocade, bound with dark green ribbon. High, broad heels; medium toe. Very heavy leather soles. 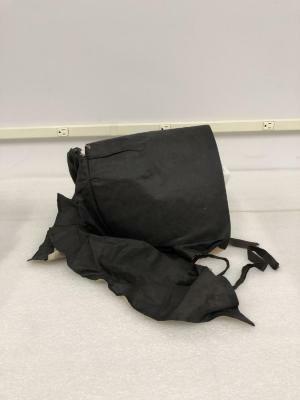 Black silk Quaker bonnet lined in white. Homespun linen and square mesh linen gauze and a piece of marbled cardboard used in stiffening. 18th century rounded drop-leaf mahogany dining table. Likely Newport made.